Jesus told stories to everyone. Even experts in the Jewish law needed help understanding the Kingdom of God. Jesus, what must I do to receive eternal life? You are the expert of Jewish law. What does the Law say? How do you understand it? The law says to love the Lord your God with all your heart and with all your soul. Love him with all your strength and with all your mind. And the law says to love your neighbor as you love yourself. Yes, you have answered correctly. Do that, and you will live. But the man wanted to make himself look good to Jesus. So he asked . . . But, Jesus, who is my neighbor? I will tell you a story to show you who your neighbor is. A Jewish man was walking down from Jerusalem to Jericho. Suddenly, he heard a noise. Quick, here's someone coming that we can attack. He's a Jewish man. Let's beat him up! His clothes are nice, so let's take them. Check for any money. It's all ours. The robbers beat the Jewish man, took all of his belongings, including his clothes, and left him to die on the side of the road. A priest happened to be going down that same road. Help me. Please help me. (to himself) Oh my, that poor man lying in the road. Is he dead? If I touch a dead man, I will be unclean. I will walk on the other side of the road. A Levite, a man who took care of the temple, also came by. Help me. Please, someone help me. (to himself) Oh no, look at that man. He's all bloody and bruised. I wonder what happened to him, but I don't want to get my clothes all bloody. Yuck. I will walk on the other side of the road. 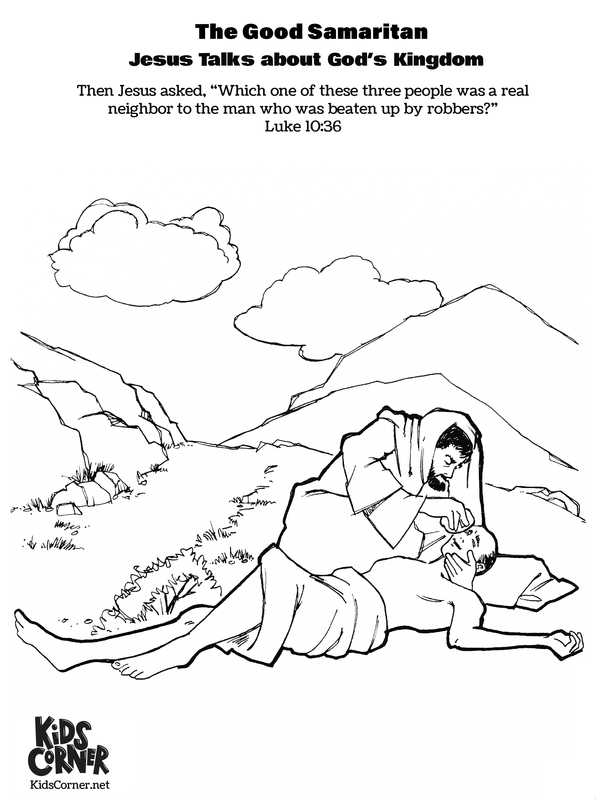 Then a Samaritan man came down the road. Jews hated Samaritans and would have nothing to do with them. The Samaritans also hated the Jews fiercely. (to himself) Oh, oh no. This poor man has been beaten and robbed. This is terrible. He might die. I can't just leave him here in the road to die. I must do something. (to the Jewish man) Sir, don't you worry. I'll take care of you. Let me first put some oil on your wounds. Then I will bandage you all up and take you to an inn where you can rest and get well. So the Samaritan bandaged the wounded man, put him on his own donkey, and took him to a nearby inn. Excuse me, innkeeper. Here are two silver coins. Take care of this man. I must go on, but when I return, I will pay you back for any extra expenses you may have for taking care of this man. When Jesus finished the story He asked . . .
Well, expert of the law, which of the three men do you think was a neighbor to the man who was attacked by robbers? The one who felt sorry for him and stopped to take care of him. You are correct. Go and do as he did. If you want to read more stories Jesus told about the kingdom of God, read the book of Luke. It's in the New Testament part of your Bible.